If your just coming to a stop dont bother down shifting to 1st, sometimes it can be difficult to do until your at a full stop. In my car it doesnt really like me to down shift to 1st before I am at a full stop, its difficult to get into gear like that. I assume its like that with all of them, but maybe mines special or broken lol. Just drove the car today after 2 weeks of not driving it and once warmed up it down shifts to first fine as long as your going slow enough. I think I was thinking of my last car, not sure. Last edited by xexok; 11-28-2010 at 12:23 AM. heres a serious dumb question. my car misfired from a clogged cat, if i bought an AP midpipe and installed it. would my cel still blink from the misfire? (i know it'll still be on due to the midpipe). would it be recommended to still change my coils/plugs/wires if they already were replaced 6months ago? do i need to reset my pcm or whatevers. Take your plugs out and see what they look like, if they still look good then you dont need to replace them. Theres some threads around with pictures of what a good or bad plug will look like. As far as the cat, if your under I think its 80k miles you should be able to get a free cat from mazda, I would do that first and then get a midpipe so that you have a cat just in case. If thats wrong someone please correct me, but I think cats have an 80k warranty. 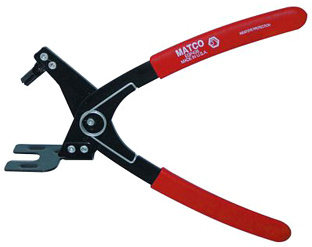 How do exhaust hanger pliers work? What goes where? Your hand works better than those pliers, just add some PB blaster and there's no problem at all! Yeah, my hand works, but it's not easy. I'm just looking for an easier way to switch the midpipe out. why do they call winterbottom frosty? That's normal, for just about any manual transmission. You may also notice that it's hard to shift to second at redline and that it's sometimes hard to get into reverse, also normal. If you really want to shift to first at speed, you need to rev match the downshift. does anyone know where to get and what size bolts/nuts for the cat>exhaust piece? Marklar you rock. First because I know it is not only my car and it is normal. Second, I never taught of rev matching while down shifting to first. I tried it today and I could easily downshift to first even at 15mph. Yea for the most part, every car is a little bit different. On my last car if I wanted to downshift into first I had to go into second and then first. Didnt need to let the clutch out in 2nd but just had to run through it before going to first. If I didnt it was like something was blocking me from getting into first. Never really had issues getting into reverse, and shifting into 2nd seems to get easier/smoother the higher the revs are. I downshift to 1st at 20mph all the time without any problems. May I ask what is the reason of downshifting to 1st at 20mph? Do you rev match? you make it difficult to resist the flambe temptation . Of course, with the key to ACC, you still have power steering with full power, but you can hit the steering lock, which is ..of course...very dangerous when still on the road. LOL youd have to be an idiot to try this. "When in doubt, make a fool of yourself. There is a microscopically thin line between being brilliantly creative and acting like the most gigantic idiot in earth. So what the hell, leap!" You can't hit the steering lock without removing the key, turning it off won't do it. .....and remember, you can't flame me!